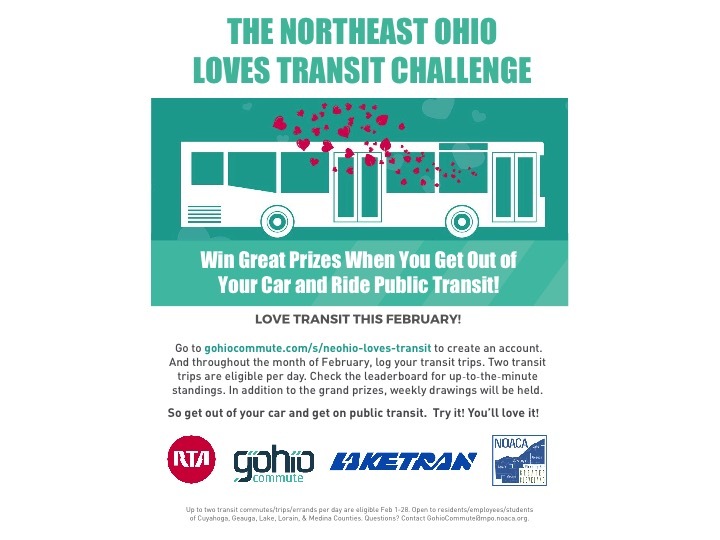 The Northeast Ohio Loves Transit Challenge runs through the month of February. This challenge is sponsored by NOACA, Greater Cleveland Regional Transit Authority (GCRTA), and Laketran. To participate, just take public transit instead of your car in February (to work, school, errands) and log your trips on Gohio Commute. That’s it! (If you don’t have an account yet, you can quickly register here.) Here’s the link to the leaderboard that will show up-to-the-minute standings starting on February 1. Weekly raffle drawings will be held, and everyone who’s logged a trip will be eligible. Winners will receive a weekly transit pass from GCRTA or Laketran. And at the end of the challenge, the top three transit riders -- who have logged the most trips -- will receive a monthly transit pass!